finished barn that I watched "raised"
The sound of an Amish barnraising re-enacted, recorded, then recreated from memory. Along a back road in Upstate New York I witnessed an Amish barnraising, in which fifty men and boys built a wooden barn in a single day. 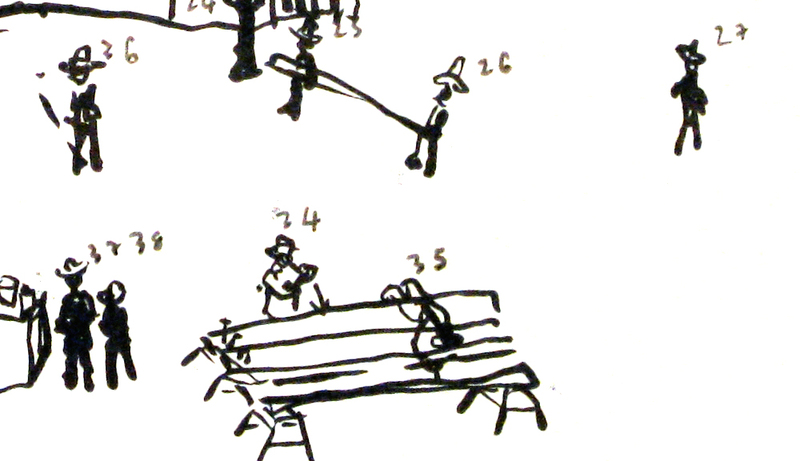 Later I drew the scene from memory, numbering each worker and recording their particular labour. In the same location several days later I re-enacted ten minutes of the labour of each worker I had seen. From these recordings I edited a sound-scape that as closely as possible follows my memory of the fifty hammering, climbing, plank-carrying men and boys and the women, small children and passers-by who watched them work. Not Photographing the Amish (barnraising) is one in a series of three works that document memories of meetings with Amish people in Upstate New York. The Amish don't believe in photography. I asked Elva, an Amish woman how she remembered particular events where non-Amish people might take a photograph, she looked at me as though I was crazy and said, "We just remember them". The series Not Photographing the Amish was made during my tenure as Theodore Randall International Chair at Alfred University, New York. An article about several works made during this tenure was written by Laurence Biemiller for the Higher Education Chronicle. I kept a studio diary of stories from my time in Upstate New York. See also Not Photographing the Amish (pigeon).